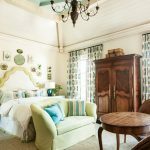 I can hardly remember a designer showhouse that left me breathless like the Atlanta Homes & Lifestyles’ 2017 Southeastern Designer Showhouse! 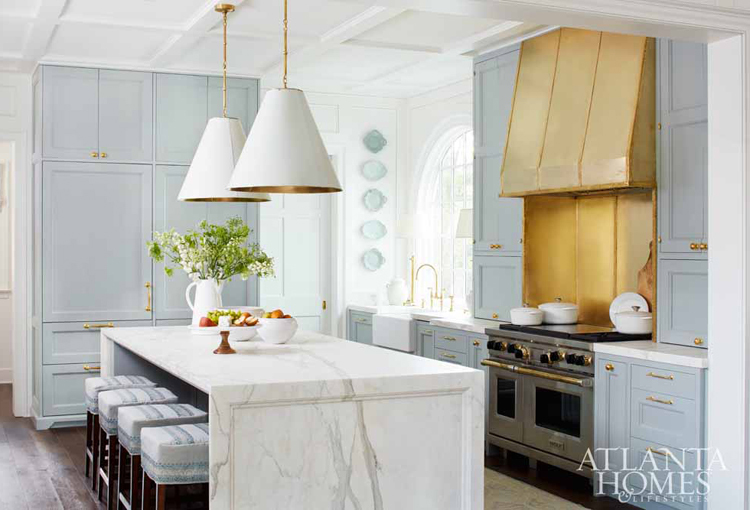 The historic James Means-designed home in the heart of Buckhead, Georgia was completely transformed by some of the most talented designers in the Southeast. 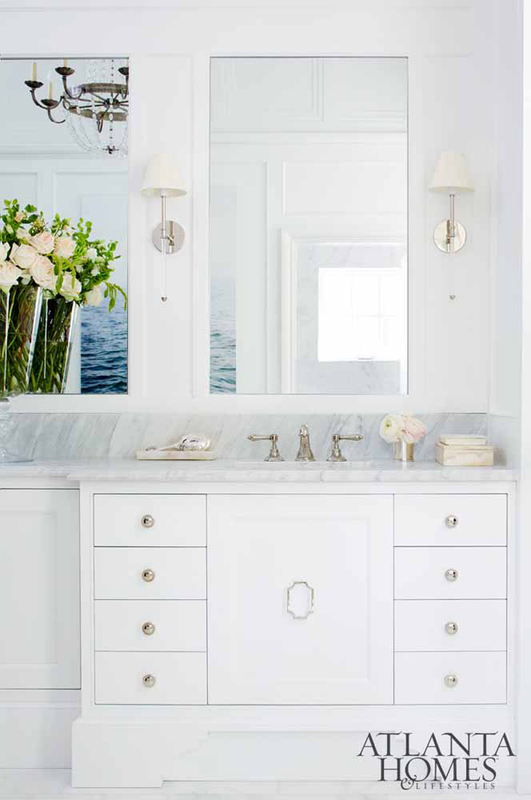 I’m only sharing a portion of the home (captured by photographers Mali Azima, David Christensen and Emily Followill), so be sure to see the rest here! I’ll take you through some of my favorite spaces below…. 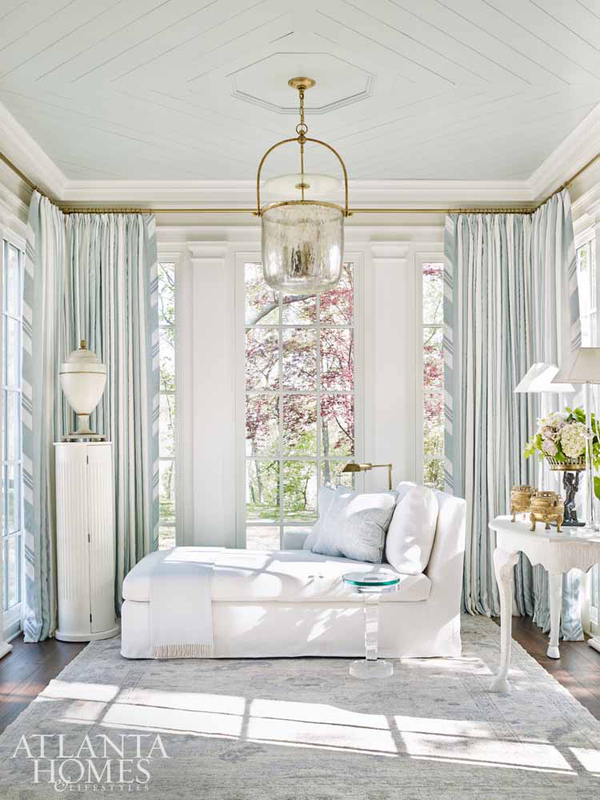 The tranquil master bedroom and sitting room designed by Tristan Harstan is one of my favorite spaces! 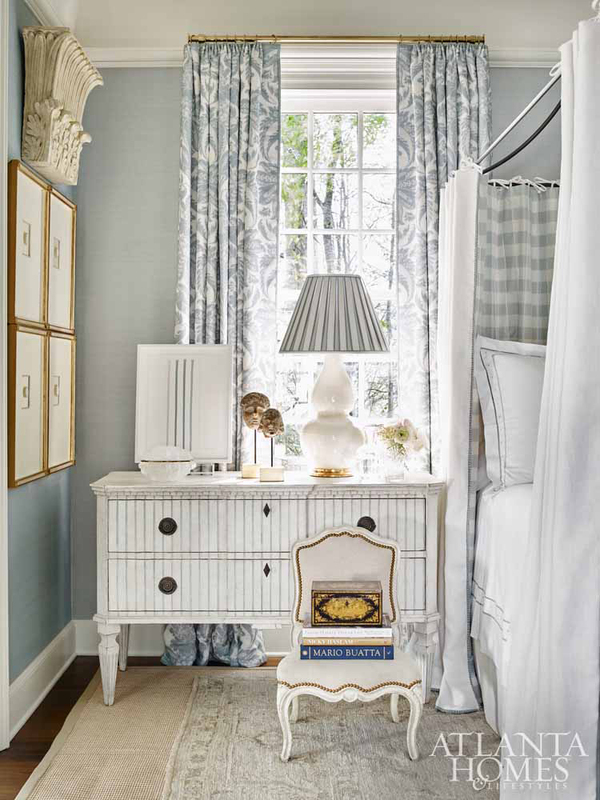 Inspired by writer and fashion designer Pauline de Rothschild, the designer created a refuge of beauty thanks to calming layers of beautiful blues. 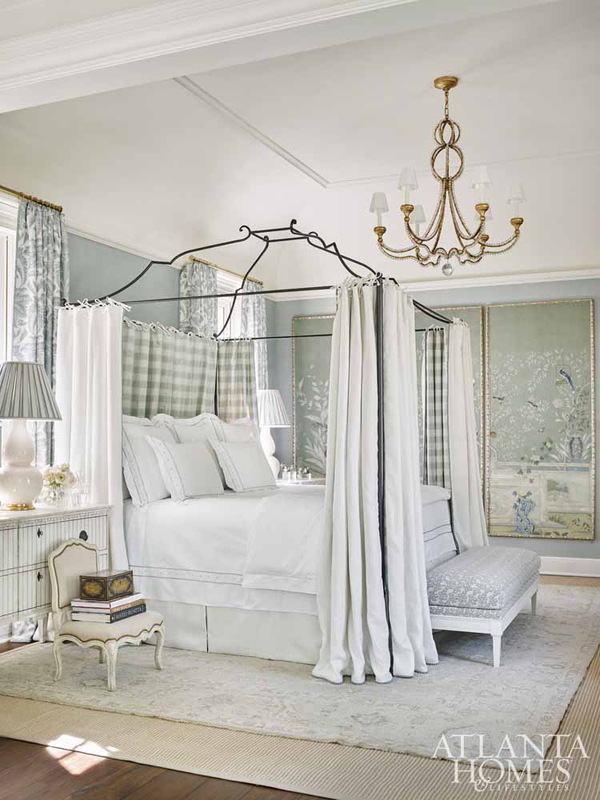 The de Gournay panels, canopy bed, and dreamy grasscloth wallcovering are just a few of my favorite elements. And pretty much every little thing about the sitting room, what a heavenly space! 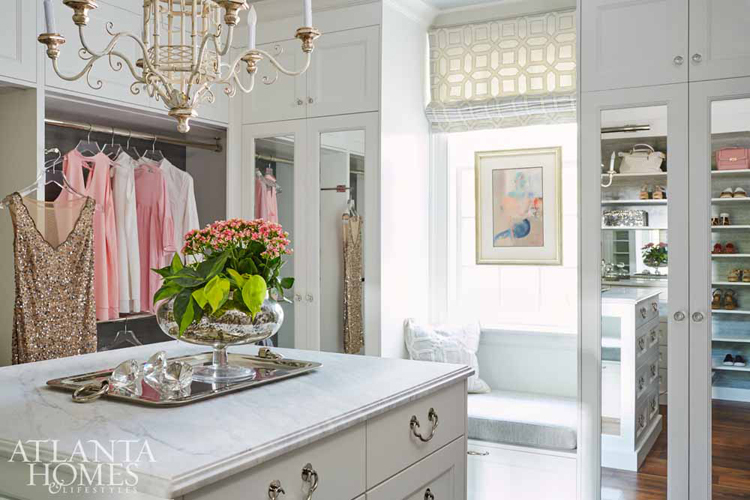 Matthew Quinn of Design Galleria Kitchen and Bath Studio designed the master bathroom and closet, spaces that are as functional as they are beautiful! 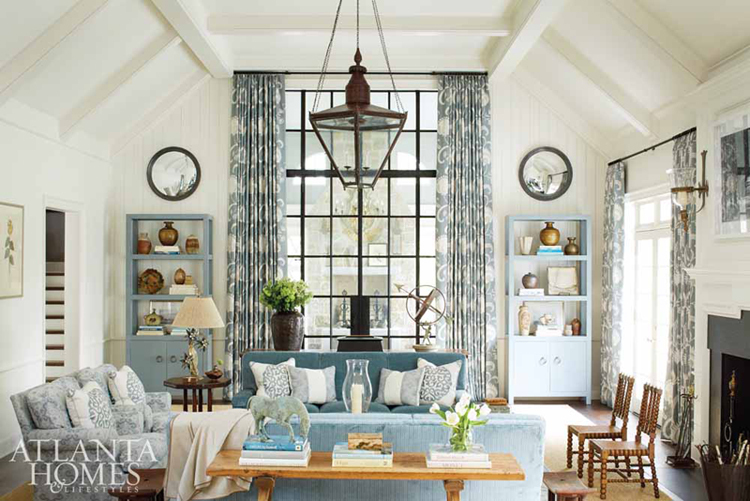 I love how the neutral tones and materials highlight the pretty pops of blue. 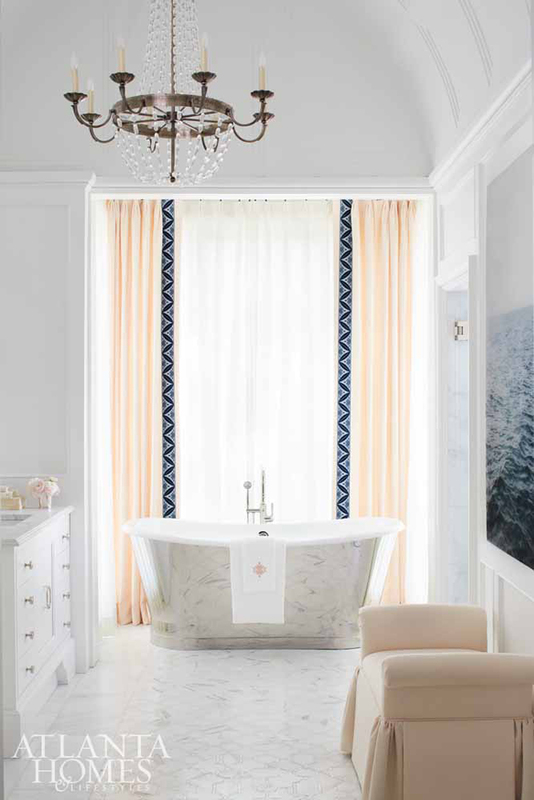 How fabulous is the pewter bathtub too?! A soak in there would be a cure-all! 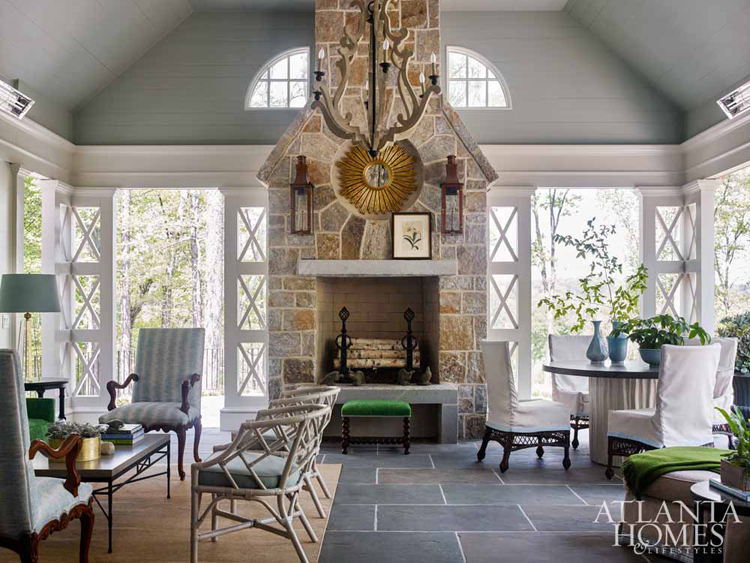 I knew right away when I saw the cozy family room that it had to be designed by Phoebe Howard, one of my all-time favorite designers! 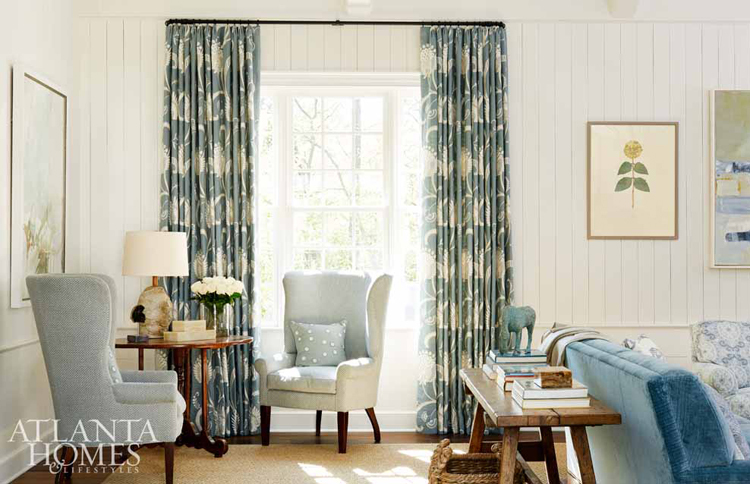 Though spacious, the talented designer kept things intimate and cozy with soft, beautiful textiles. The inspiring mix of antique pieces with amazing custom ones keeps the vibe fresh and casual, exactly what you’d want in a space meant for family living! Next on my list of favorites is the the state-of-the-art kitchen, designed again by Matthew Quinn of Design Galleria Kitchen and Bath Studio! 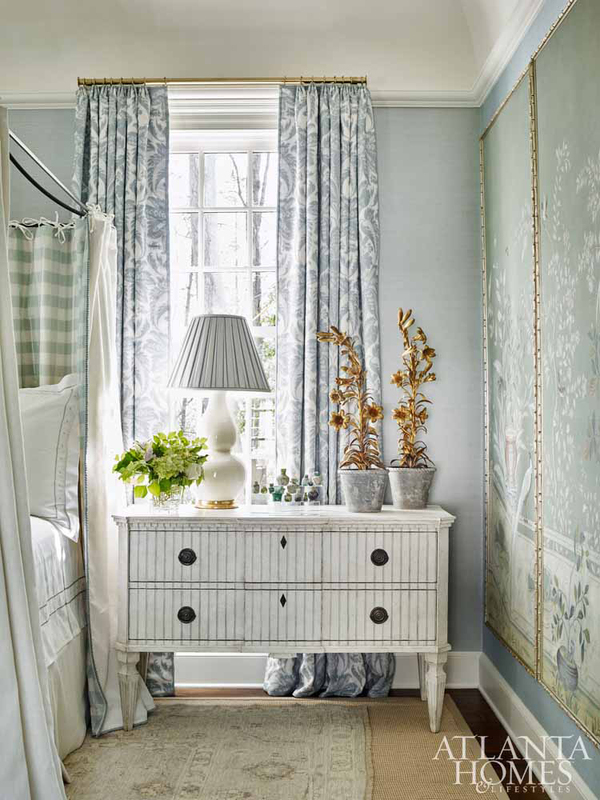 The cabinetry painted Light Blue by Farrow & Ball is the most memorable element for me (of course! ), and looks amazing paired with the marble and brass. I mean, seriously, that hammered brass hood?! To die for! 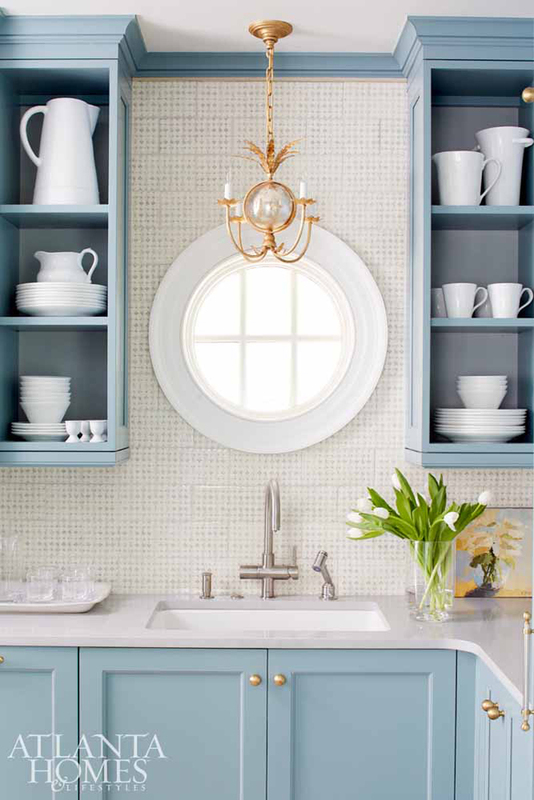 Interior designer Lauren DeLoach took her cues from the blue cabinets in the kitchen when designing the classic breakfast area. 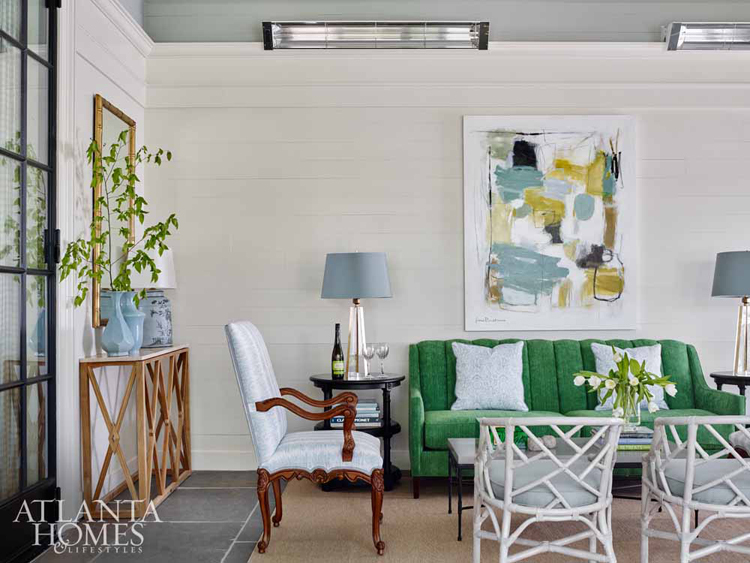 She had the shiplap walls painted a muted shade to match, then filled the built-ins with antique creamware…love how they stand out against the blue! 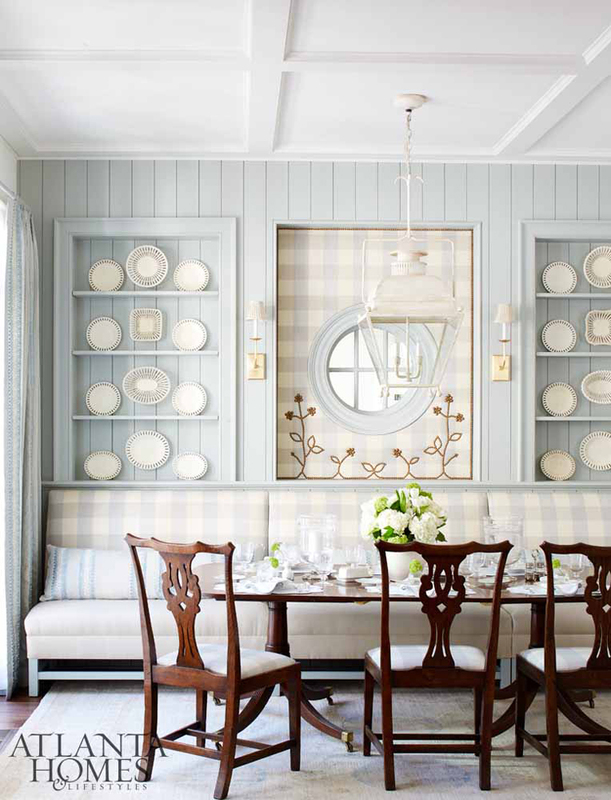 I also adore the Cowtan & Tout buffalo check on the banquette! 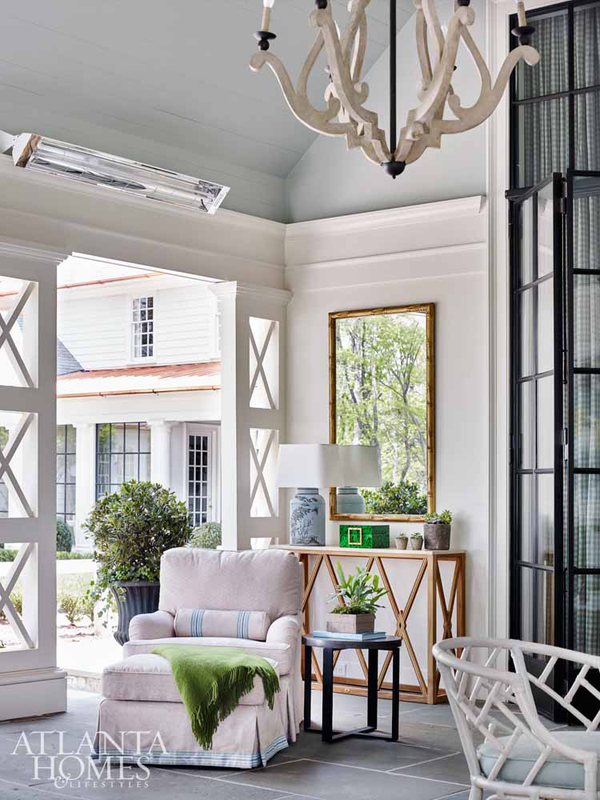 On to the veranda by Will Huff and Heather Dewberry of Huff Dewberry–the perfect transitional space between indoors and out. 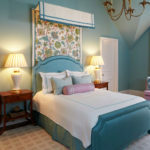 The mossy green and sky blue color palette that fills the room was inspired by none other than Mother Nature herself. And as drop dead gorgeous as the furnishings and fabrics are, everything is durable and outdoor-friendly! I’m ready for some iced tea and southern breezes! Lastly we have the rear courtyard designed by landscape architect Richard Anderson…a true outdoor paradise! There’s nothing like a luxurious infinity pool to make your home feel like an endless vacation! 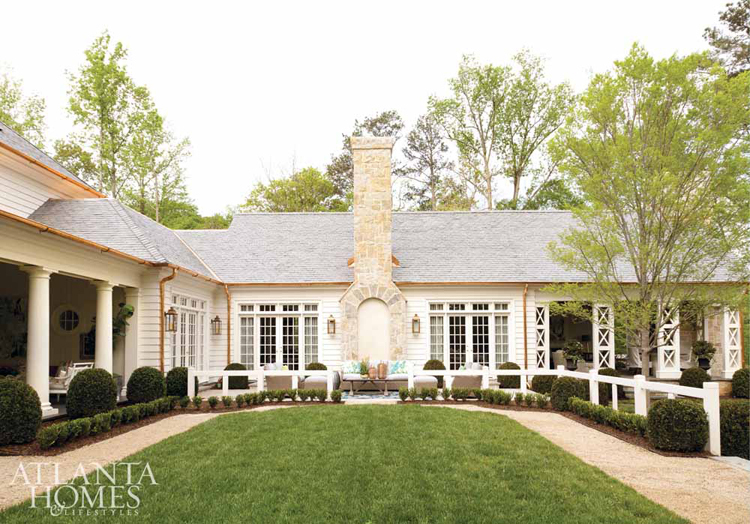 There’s still so much more to see…finish your tour, read all about the home and learn sources over at Atlanta Homes & Lifestyles! Wow, this home is so beautiful. Elegant in every sense, but very welcoming at the same time. Love it. This is absolutely stunning!! Thanks so much for sharing. Now THAT is a classy pile of bricks! What a lovely home. The color palette is so cool and tonal, and very calming. I agree with you, that bedroom is gorgeous. Will have to read more about this home. Oh, Atlanta! Live big dream bigger! I love this house, I love the space! Fablous home. Very nice designer. So warm and inviting. So lovely home, thank you for this great post! I love it.